The Reserve Bank of India (RBI) has formed an expert committee to look into the various challenges being faced by MSMEs and suggest ways and measures to rejuvenate them. 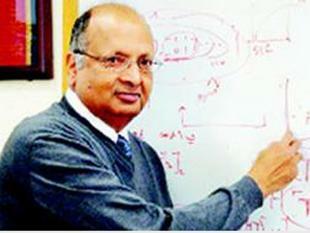 Committee would be chaired by former Securities and Exchange Board of India chairman UK Sinha. Review the current institutional framework in place to support the MSME (micro, small and medium enterprises). Examine the factors affecting the timely and adequate availability of finance to the MSME sector. Study the impact of the recent economic reforms on the sector and identify the structural problems affecting its growth. Conduct a study about the best global practices with respect to MSMEs and recommend its adoption in India, wherever appropriate. Review the existing MSME focused policies and its impact on the sector. To propose measures for leveraging technology in accelerating the growth of the sector. The MSMEs are termed as engines of growth of India. MSMEs account for more than 80% of the total industrial enterprises in India creating more than 8000 value-added products and contribute about 8% to the GDP. About 45% of total manufacturing output and 40% of the total exports from the country are from MSMEs. To stop setting up new colleges from 2020 and review the creation of new capacity every two years after that. No additional seats should be approved in traditional engineering areas such as mechanical, electrical, civil and electronics and suggests that institutes should be encouraged to convert current capacity in traditional disciplines to emerging new technologies. To introduce undergraduate engineering programmes exclusively for artificial intelligence, blockchain, robotics, quantum computing, data sciences, cybersecurity and 3D printing and design. Why the recommendations are made? Current capacity utilisation in traditional disciplines is just 40% as opposed to 60% seat occupancy in branches such as computer science and engineering, aerospace engineering and mechatronics. As per the reports, there were no takers for 51 per cent of the 15.5 lakh B.E/B.Tech seats in 3,291 engineering colleges in 2016-17. The panel has said that concessions should be made for applications already in the pipeline while not allowing new engineering institutes should be set up from 2020. The Reserve Bank of India (RBI) has set up an expert committee, headed by its former governor Bimal Jalan, to suggest how the central bank should handle its reserves and whether it can transfer its surplus to the government. RBIs contingency fund core reserve is only around 7% of its total assets and the rest of it is largely in revaluation reserves. Revaluation reserves fluctuate with corresponding changes in currency and gold valuations. In 2017-18, the central bank’s contingency funds and revaluation reserves stood at ₹2.32 trillion and ₹6.92 trillion respectively. The data shows that the growth in revaluation reserves has far exceeded the growth in the contingency fund. While revaluation reserves have more than tripled from ₹1.99 trillion in 2008-09 to ₹6.92 trillion in 2017-18, the contingency fund has grown 50% during the same period from ₹1.53 trillion to ₹2.32 trillion. Core Reserves are considered to be of highest quality and consists mainly of share capital and disclosed reserve. They are fully available to cover losses. Revaluation reserves arise from revaluation of assets that are undervalued in the bank’s books, Ex: Marketable Securities. The Revaluation Reserves can be used as a cushion for unexpected losses and depends mainly upon the level of certainty that can be placed on estimates. Why the committee was formed? Decide whether RBI is holding provisions, reserves and buffers in the surplus of the required levels. Propose a suitable profits distribution policy taking into account all the likely situations of the RBI, including the situations of holding more provisions than required and the RBI holding lesser provisions than required. Suggest an adequate level of risk provisioning that the RBI needs to maintain. The committee is expected to provide for an objective criterion to address the friction between the government and the RBI. Union Government has constituted six-member committee to look at selling as many as 149 small and marginal oil and gas fields of state-owned Oil and Natural Gas Corp (ONGC) and Oil India Ltd (OIL) to private and foreign companies to boost domestic output. India wants to cut oil import dependence by 10% by 2022. 149 smaller fields of ONGC, OIL and other explorers accounted for just 5% of domestic crude oil production. 95% of domestic production comes from big oil fields. So smaller fields could be given out to private and foreign firms, so that ONGC could concentrate on big ones where it could rope in technology partners through production enhancement contracts (PEC) or technical service arrangements. The government of India constituted the National Commission on Farmers (NCF) on November 18, 2004. The NCF was chaired by Professor M.S. Swaminathan. It submitted five reports to the government. The reports had suggestions for “faster and more inclusive growth” for farmers as was envisaged in the Planning Commission’s Approach to 11th Five Year Plan. The fifth report was the most crucial as it contained suggestions for inclusive growth of farmers and agriculture sector. NCF’s Swaminathan Commission Report aimed at working out a system for food and nutrition security, sustainability in the farming system, enhancing quality and cost competitiveness of farm commodities and also to recommend measures for credit and other marketing related steps. The Commission observed that farmers needed to have an assured access to and control over rightful basic resources. These basic resources include land, water, bioresources, credit and insurance, technology and knowledge management, and markets. It observed that agriculture must be implemented in the concurrent list from the state list — hence putting it as a matter of concern for both the Union and the states. 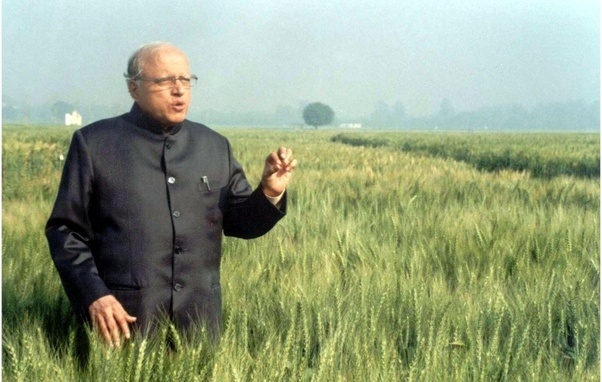 One of the key reforms was land reforms. It was aimed to address the issue of access to and for both crops and livestock. The commission said that the inequality in landholdings in shown starkly in land ownership. It said that in 1991-92, the share of the bottom 50 per cent of the rural households in the country’s total land ownership was only three per cent. The top 10 per cent owned as much as 54 per cent. Union Finance Ministry has constituted Competition Law Review Committee to ensure that legislation is in tune with changing business environment. The committee will review competition regulations in view of changing business environment and suggest the necessary changes to strengthen and re-calibrate existing law to promote best practices. It will also look into international best practices in competition field with thrust on anti-trust laws, merger guidelines and handling cross-border competition issues. It will also study other regulatory regimes, institutional mechanisms and government policies which overlap with Competition Act. It will submit its report within three months of the date of its first meeting. The Competition Act was passed in 2002 and Competition Commission of India (CCI) was set up in 2009. However, since inception of the commission, the size of the economy has grown immensely making it one of the fifth largest economies in the world. In this context, it was seen necessary to that Competition Law is strengthened and re-calibrated to promote best practices which result in the citizens of this country achieving their aspirations and value for money. The Supreme Court has formed a Committee on Prison Reforms chaired by former apex court judge, Justice Amitava Roy, to examine the various problems plaguing prisons in the country, from overcrowding to lack of legal advice to convicts to issues of remission and parole. Apart from the above four issues, committee will comprehensively examine and respond to the dire necessity of reforms in prisons. Committee to examine the extent of overcrowding in prisons and correctional homes and recommend remedial measures, including an examination of the functioning of Under Trial Review Committees, availability of legal aid and advice, grant of remission, parole and furlough. The panel would also probe the reasons for violence in prisons and correctional homes and recommend preventive measures. 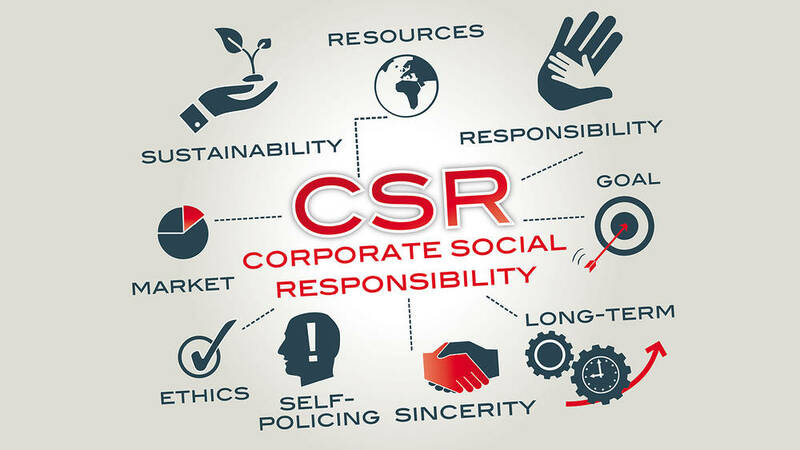 The Union Ministry of Corporate Affairs (MCA) has constituted High Level Committee on Corporate Social Responsibility which will review existing framework and guide and formulate roadmap for coherent policy on Corporate Social Responsibility (CSR). It will review existing CSR framework as per Act, Rules and Circulars issued from time to time and recommend guidelines for better enforcement of CSR provisions. It will analyse outcomes of CSR activities, programmes and projects and suggest measures for effective monitoring and evaluation of CSR by companies. It will also give suggestions on innovative solutions, use of technology, platform to connect stakeholders, and social audit. It will submit its report to Government within three months from date of holding its first meeting. The committee was set up by Government in September 2017 to suggest a road map for adoption of 5G. It has proposed promulgation of key norms on regulatory matters by March 2019 in order to facilitate early deployment of 5G technology. It expects commercial rollout of 5G in India by 2020. It noted that 5G technologies will start entering service globally beginning 2019 and advance to full range of services by 2024. It recommended that deployment of 5G in India should be classified into three phases based on technologies and use cases. By early embracing 5G technology, India can accelerate its dividends and potentially also become innovator in 5G applications. It expects that economic impact of 5G to be over $1 trillion. The committee noted that vendor ecosystem for 5G is maturing as telecom tech giants like Nokia, Ericsson, Huawei and ZTE have production ready equipment in trials based on 5G-NR standard. China Telecom is doing a pilot deployment in six cities ahead of the full 5G commercial launch in 2020. The committee also pointed out conflicting considerations faced by early adoption of 5G. The early adoption will likely make equipment needed for 5G roll out more expensive and it will also be glitchy as needed for cost maturing. However, early adoption will fast track India’s embrace of 5G’s benefits and increase opportunities to develop innovative use cases that support Indian needs. Committee is created to suggest measures and legal framework to effectively deal with incidents of mob violence and lynching. The move came after recent Supreme Court direction to central government on the issue of mob violence and lynching. The apex court had denounced sweeping incidents of lynching as an affront to the rule of law and called for law to deal with such horrendous acts of mobocracy. It had passed a series of “preventive, remedial and punitive” measures to deal with lynching and mob vigilantism. 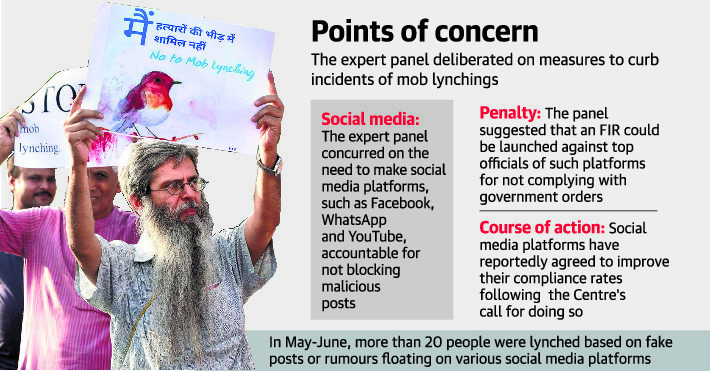 It had made Centre and state governments accountable for mob violence and lynching and had asked them to take steps to curb and stop dissemination of irresponsible and explosive fake messages and videos on social media platforms which incite such incidents. FIR against officials : A senior government official said social media platforms like Facebook, WhatsApp, YouTube and Twitter etc. would be made accountable for not blocking malicious posts and videos when brought to their notice and an “FIR could be lodged against their country heads” for not complying with government orders and they could be prosecuted under law. Timely compliance of objectionable content removal requests should be ensured. Some countries employ non-governmental organisations and volunteers who proactively surf the Internet. Special task force: Appoint an officer in each district at the level of Superintendent of Police, set up a special task force to gather intelligence, and closely monitor social media contents to prevent mob attacks on people on the suspicion of being child-lifters or cattle smugglers.